Wife. Mother of 3. Homeschooling. Homemaker. Loves Jesus and Coffee, Warriors Mama. DIY and crafts. A crocheter! Caregiver. Health and wellness advocate. Living Life a day at a time! 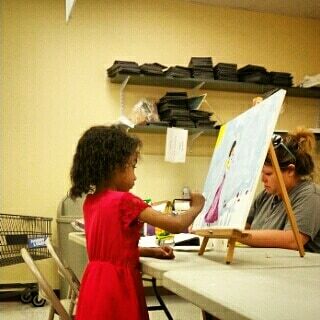 My Princess Artist, working at her last painting before going to an official art school. I still remember the first time my husband took her to the art class at Hobby Lobby and the instructor told him, he should take our daughter to the school, because she was special. My little brush started drawing she wasn't even 3, and arts is her passion. She enjoys making things out of paper, boxes and pretty much everything she can find and transform. We are so blessed that she was not only accepted at the art school, as well she got a full scholarship. For sure we couldn't afford it, but our baby is being given the opportunity to experience her gift and passion. The fact that we are moving, has been affecting her so much. Mainly because she is worried about her art school and classes. Quite too often I have been spotting her looking sad and crying, and it breaks my heart. I have been doing my all to reinforce to her that moving os for sure a big change, but she will have the opportunity to keep improving and developing her art skills and passion. Besides we are moving to a bigger city and there will be a lot of people and places there. And while it all still on the making process, I feel more and more certain about the journey God has been preparing me for. Last year he answered one of my prayers, and he has been molding me and preparing me to become his instrument. I can't wait for the day, not only I will be able to help my family live our dreams and aspirations, but I can help my fellow friend that are enduring the same hardship my family do right now. I'm a daughter, BA in Law, Wife, stay-at-home mom of 3 precious little ones. This blog is to share my story as a mother of 2 beautiful and inspiring warriors and 1 miracle. On the sidewalk from being a full time mother I am a crocheter, I love crafts and DIY, as well as fitness and some bit of cooking. Recently I just started my own home based business and have been enjoying very much this journey towards discovering my own strength. I gave birth to a Hero. Get to know Caesar Sant! Book REVIEW Time!!!!! Do you love Math???? :) Language Fundamentals Book Review!!!! It will be happening sooner than later!